Star Wars is arguably the most unique of my favorite long running franchises because it can take so many forms from movies, to animated TV shows, to video games and novels that are all part of one big space opera. It also gives me the opportunity to discuss and review things I wouldn’t normally watch or talk about. 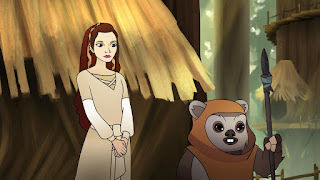 Case in point for today’s review is an animated mini-series from the Disney Junior channel that I’d normally have no interest in, but sense it’s part of the “Star Wars” universe, of course I’m going to view it and give my two cents on it. So, let’s take a quick look at the 2017 animated Mini-Series “Star Wars: Forces of Destiny” to see if there’s anything worthwhile about it. 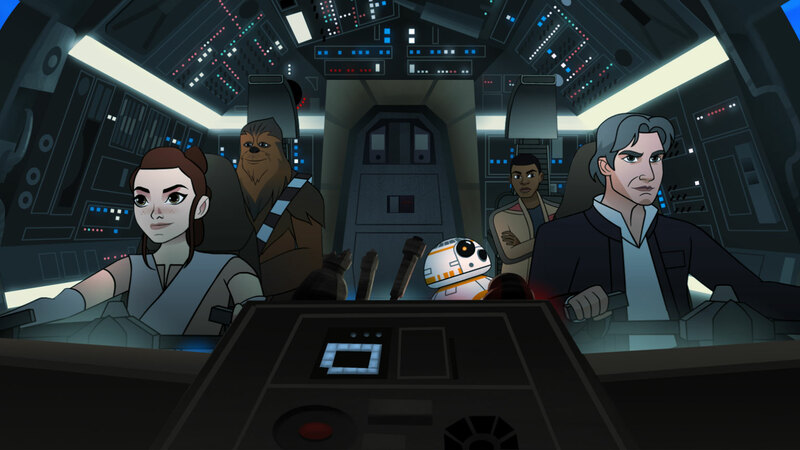 This show is an anthology series that spans all across the Star Wars time line, and gives us short stories revolving around various characters from the different live action movies and other animated shows. The main selling point of this series is that it focuses specifically on the female characters of the Star Wars universe, and through these shorts we explore the little details and events that shaped them into the characters we’ve grown to love. It’s about as simple as they get, no real high stakes, no famous villains, just the humble life and times of these characters and the basic morals they have to convey. 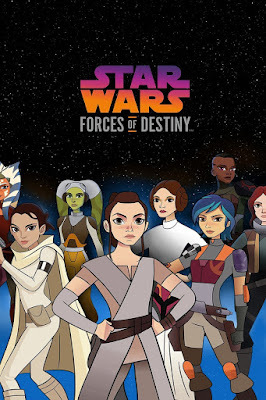 Personally, I love that we now have an animated TV series that brings together all the Star Wars girls together into one program. It’s cool to see their individual stories, and it’s especially fun to see the various crossovers between these characters. Half the time this series feels like a collection of deleted scenes that could have fit within the events of the films, and I just find it appealing to see all the little details. Other times if feels like small expansions of both “The Clone Wars” and “Rebels” TV shows, which is great because I love both of those. 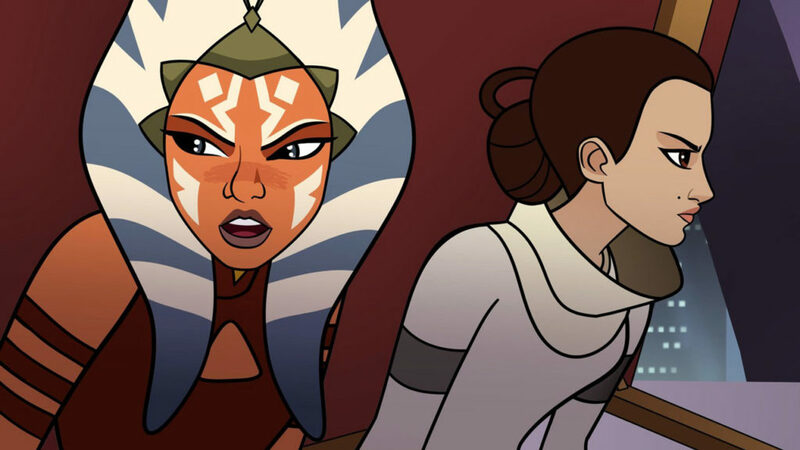 Years ago, I put together a list of my personal top 10 favorite Star Wars girls, and I often imagined what it would be like seeing them all rounded up together. So, this series is actually a minor dream come true. Seeing all the marketing and posters of this series with all the Star Wars girls together gives me the impression that this might just be the next best line up of female characters sense the Disney Princess line up. It’s also great that the majority of the voice cast are the same talents from the movies and shows, with some small exceptions. 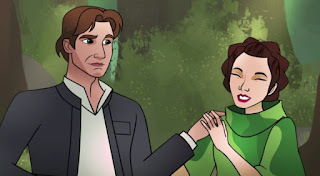 Princess Leia naturally had to be voiced by someone different, and while Natalie Portman didn’t reprise her role as Padme Amidala, she’s at least still voiced by Catherine Taber who was the voice of the character in both the animated movie “Star Wars: The Clone Wars” and the animated TV series that followed. Both Daisy Ridley and Felicity Jones reprise their respected roles of Rey from “Star Wars: The Force Awakens” and Jyn Erso from “Rouge One: A Star Wars Story”, which is fantastic and I love that both of them are still committed to the parts even in something small like this series. Even Lupita Nyong’o reprises her role as Maz Kanata who was a supporting character back in “Star Wars: The Force Awakens”, and in this series, acts as the storyteller linking all these shorts together, which is a great touch. Now personally, Ahsoka Tano is my absolute favorite character of all the Star Wars girls, and seeing more of her story from the time line of “Star Wars: The Clone Wars”, as well as the return of voice actress Ashley Eckstein is an instant joy. 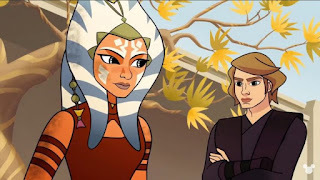 In the episode titled “Teach You, I Will”, we see Anakin and Ahsoka lightsaber training together in the Jedi temple while also working off each other’s personalities, which was such simple treat to see more of that. 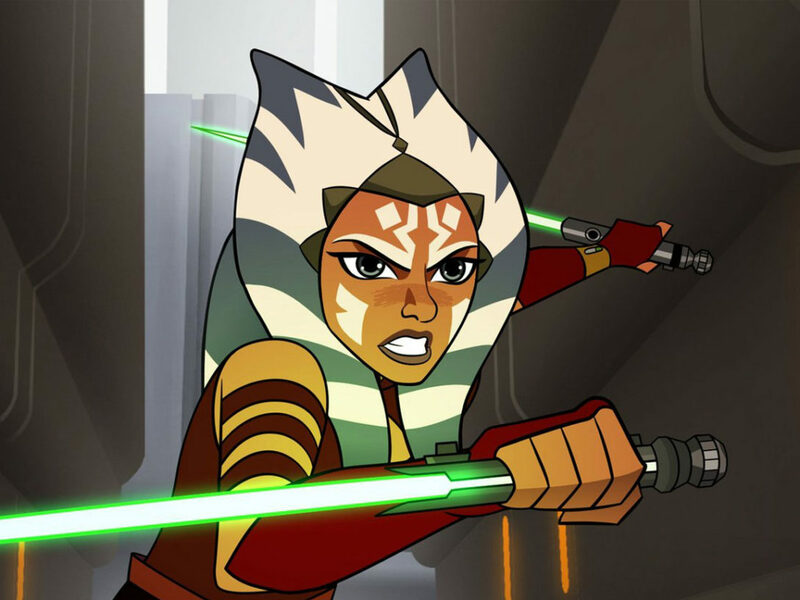 One little detail that just put a smile on my face was hearing Anakin refer to Ahsoka as “Snips” once again, which was his little nick name for her back in the TV series. In the episode "Unexpected Company", Ahsoka travels with Anakin and Padme, only to get her first clue of their secret marriage, and that's an awesome detail that The Clone Wars didn't even provide. Also, I’m a fan of the “Star Wars: Rebels” series, so more little adventures revolving around both Sabine and Hera are always welcome. Now while this series mainly focuses on the female characters, we do still get appearance from other hero’s including Han Solo, Anakin Skywalker, Yoda, Chewbacca, and obviously the droids C-3PO, R2-D2, Chopper and BB-8 are all present. Even John Boyega reprises his signature role as the stormtrooper defector Fin from“Star Wars: The Force Awakens” and the scenes between him and Rey are always fantastic. 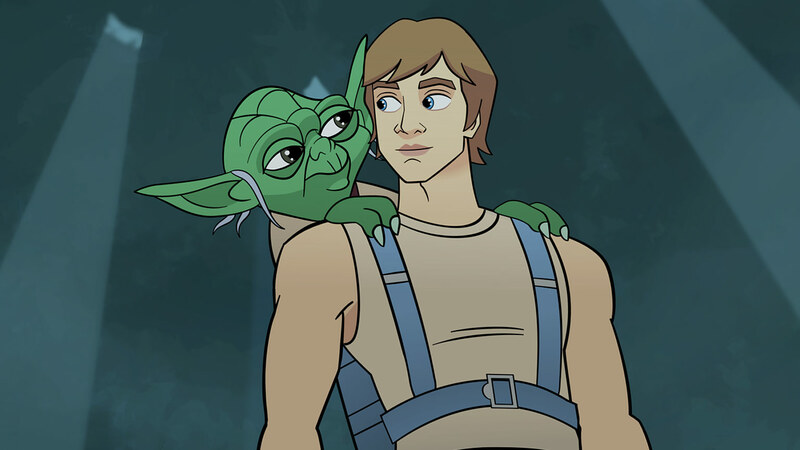 Plus, the great Mark Hamill even reprises his signature role as the voice of Luke Skywalker, and even has his own stand alone episodes without any female accomplices. The shorts revolving around either Princess Leia or Rey feel the most like deleted scenes from the films and for the most part they do feel like events that could have occurred in the films. In the short titled “Ewok Escape”, we see more of what happened during “Return of the Jedi” when Princess Leia was separated from the group and paired with the Ewok Wicket, as well as how she got that nice forest dress that she was suddenly wearing in that film. On a side note, this makes for the first time that either Wicket or the Ewoks have made an appearance in the Star Wars universe sense the 1980’s “Star Wars Ewoks” cartoon show. Even the pink coated Princess Kneesaa from “Star Wars Ewoks” appears and officially becomes part of cannon. Also the giant Gorax monster from the live action Ewok movie "Caravan of Courage" makes an appearance in an episode titled "Traps and Tribulations". The short titled “Beasts of Echo Base” is directly inspired by a deleted scene from “The Empire Strikes Back” in which the Wampa creatures attack just prior to the battle of Hoth. 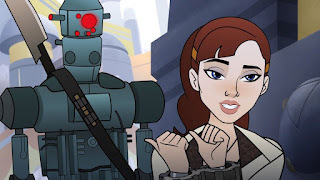 Also, while this show was launched before the movie "Solo: A Star Wars Story" came out, it did eventually bring in Qi'ra, who was the lead love interest in that film. Best of all is that she shared an episode with my favorite pirate Hondo, who thankfully is still voiced by the distinguished Jim Cummings. 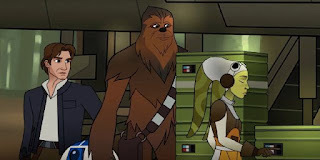 One of my favorite shorts titled “Tracker Trouble” is set during “Star Wars: The Force Awakens” and it further explores that time in which Rey and Finn were aboard the Millennium Falcon with Han Solo and Chewbacca, and it’s so wonderful to see more of that team friendship that was built between those characters. 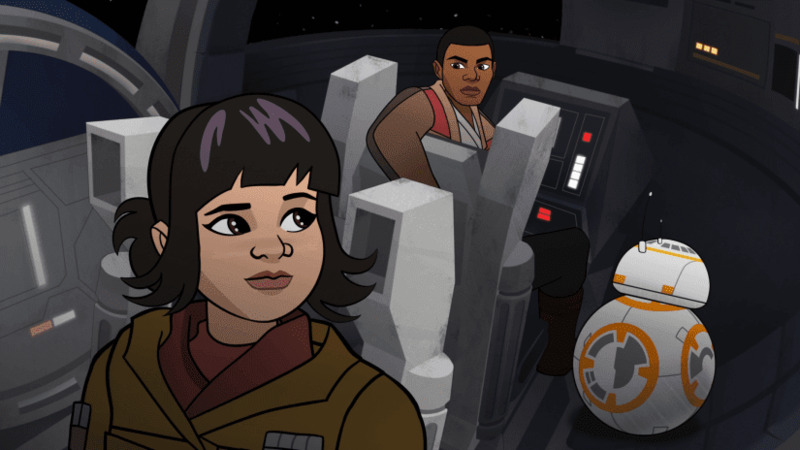 Some of the weaker episodes take place during the events of "Star Wars: The Last Jedi" as we have more goofy scenes with the Porgs, as well as more dull ventures with Fin and Rose during their mission to the casino planet. One good thing to note is that the show highlights Queen Amidala in ways never seen before in the movies, like knowing how to calm a giant monster without any force powers. Of course, one of the shows main highlights is seeing all the different crossovers between these various Star Wars girls. 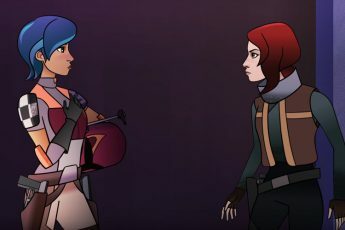 We see Princess Leia go on a small mission with Sabine, we see more interactions between Ahsoka and Padme, and one of my favorite additions was a short crossover between Jyn Erso and Sabine Ren titled “Accidental Allies”. Seeing those two characters briefly interact with one another was great, and their conversation was very in-character. 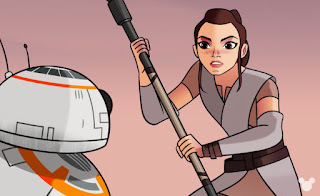 One down side is that Rey is set in a timeline where she can’t really meet any of the other girls, which is unfortunate because I’d love to see he interact with other female characters like Ahsoka and Jyn. My favorite crossover by far came from a short titled “An Imperial Feast” which is set just after the final battle from “Return of the Jedi”. In this short we see Captain Han Solo meet Captain Hera Syndulla from “Star Wars: Rebels” and seeing those two banter with each-other on who’s got the best ship is like the greatest of fan fiction come to life. Actually, just seeing the Millennium Falcon parked right next to the Ghost ship was a fan boys dream come true. This was also our first confirmation that Hera, Chopper and the Ghost survived through the original trilogy, which is very satisfying. I think I covered enough of the shows contents, but let’s talk a little about the quality of the show. 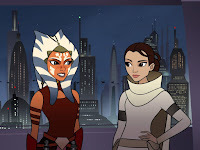 This series is actually the first 2D animated Star Wars project sense the animated 2003 Mini-Series “Star Wars: Clone Wars”, but still “Star Wars: Forces of Destiny” is very different as it’s much lighter in tone and geared more toward little kids. There aren’t any intense battles, or high stakes, and the action on display is very basic, but fun if you keep a humble perspective. The animation itself is fine, but nothing special either. Actually, half the time the animation looks like the equivalent of what fans can create on their home computer and upload to YouTube. I should give the animators some credit, they at least convey the right amount of emotion in the faces, and the way the characters move in the environment does look very good, as opposed to other cheaper 2D projects in which things can look very sloppy if not handled with care. 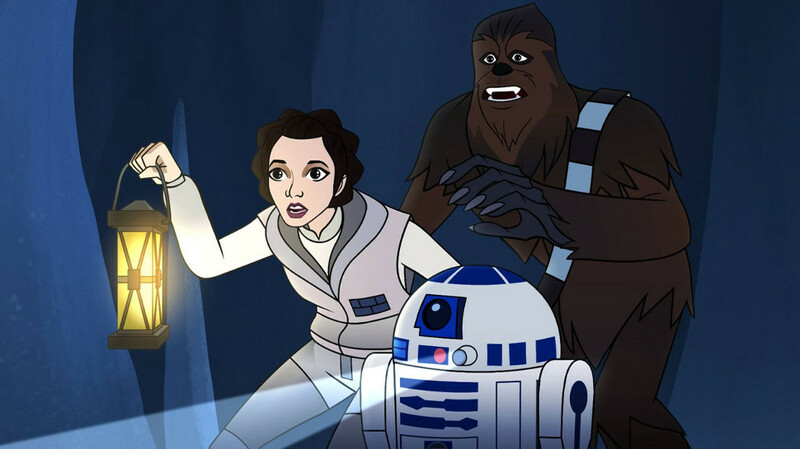 Overall, “Star Wars: Forces of Destiny” is nothing demanding and can never reach the same heights of previous animated “Star Wars” programs, but it’s still perfectly harmless and it’s even cute and appealing in its own simplistic way. I would only recommend this Mini-series to die hard Star Wars fans or to little girls that are just getting into the series. If you keep your expectations low but open for whatever the show has to offer, you might just find it kind of appealing, as I did. 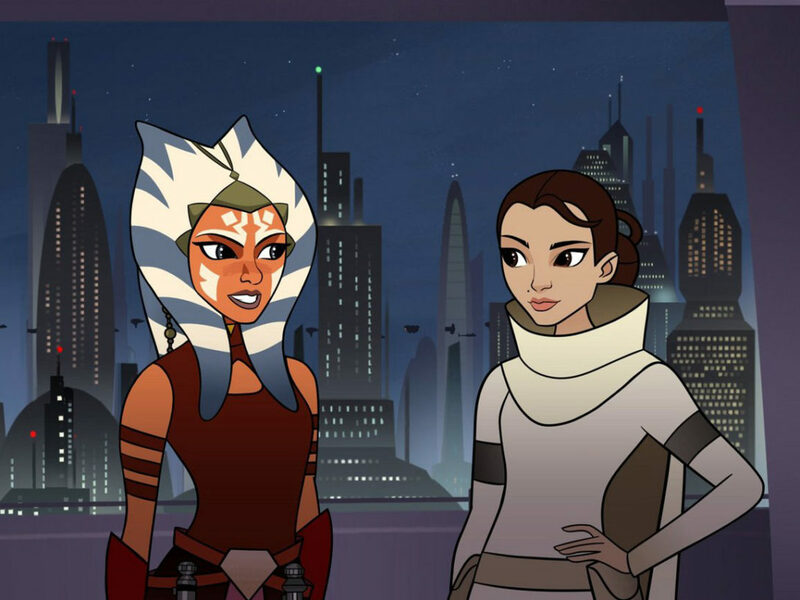 More than anything, this series is a great little excuse to bring all the Star Wars girls together into one program, and it’s still respectful to the continuity of the saga. It’s charming, humble and a perfectly welcome add-on to one of my favorite franchises, even if it’s nothing really spectacular. You can watch the shorts grouped together on the Disney Junior channel, or just pull up the individual shorts on Disney YouTube, they aren’t long and harmlessly derivative for us longtime fans. 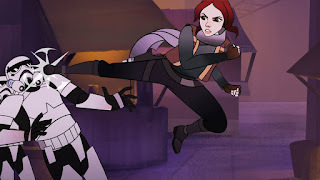 I give the 2017 mini-series “Star Wars: Forces of Destiny” 3 stars out of 5.